Literatures & Cultures Librarian Katrina Spencer visits Downtown Guadalajara Mexico with the Spanish School in 2010. What were you doing in this photo? I was studying in Guadalajara Mexico, completing my last requirements for my degree. There was a scheduled field trip for touring the downtown portion of the city. Here we’re all in an historic governmental building. It looks like one of my classmates caught me reviewing photos in my camera. How have things changed in your life since then? A number of things have changed in the last seven years. I’ve gained some weight. ;) Traveled to West Africa. Studied Arabic. (Mastering Spanish certainly gave me the confidence to approach other languages, though just last week I had a “por vs. para” slip up.) Started working in the professional world. And. . . have finally approached persuading myself to explore meatless meals. I get paid well to listen to and help students I love. I still have an appetite to build on the minimal foundation I have in Arabic. There are so many things I want to read: David Sedaris, Toni Morrison, Nicole A. Cooke… I’d also like to meet my niece. For more posts like these, like our Facebook page. 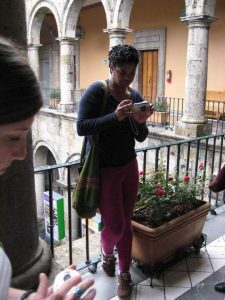 This entry was posted in LIS Staff Interest, lisblog, Middlebury Community Interest, middpoints, Post for MiddNotes, Post for MiddPoints and tagged Davis Family Library, Mexico, Spanish, Throwback Thursday on October 5, 2017 by Katrina Spencer.